Eurostar passengers at London's St Pancras Station are facing lengthy queues before boarding, with the company advising essential travel only. Wrapped in several layers, with thick woollen gloves on and a hooded sweatshirt covering his head, Tim Wilsehut stands stamping his feet with the Eurostar check-in desks tantalisingly close. "The feeling in my toes is starting to come back," jokes the 20-year-old. 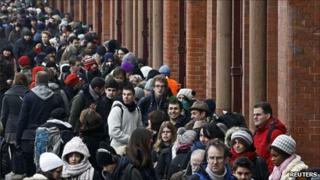 Having heard reports of Monday's eight-hour queues, he knew the wait at St Pancras Station would be no laughing matter. Originally booked on an 0730 GMT service, he had arrived at 0615 on the morning's first Tube and was told to head to the back of the line where about 100 people had begun queuing in the early hours. By then, the end had disappeared out of sight. After three hours, he and friend Ingrid Van Haaren, 20, can finally see the light at the end of the Channel Tunnel. They are confident of making it back to their native Eindhoven in The Netherlands without too much more trouble, after three months' study at London's Queen Mary University. "The line has been progressing quite well. It was expected, so we just have to wait," adds Mr Wilsehut. Away from the queue groups mill around, waiting for information. Messages piped over the PA system are not comforting; don't travel unless essential, those without tickets go home, no more bookings until Christmas Eve. Those with tickets simply joined the stream of grim-faced passengers trudging with roller-cases through the slushy streets for a full 10 minutes to reach the back of the queue, down a side street opposite the Shaw Theatre. Among the new arrivals is Sandy Poustie, 69. Having been snowed in at her village of Silverton, in Devon, she had already endured a tough journey to the capital on Sunday. Given a lift by a kindly couple with a four-wheel drive car, she arrived at Exeter Station to find no staff to run her scheduled service. Two train-loads of passengers had to cram on the next one, she said. Mrs Poustie arrived more than two hours ahead of her scheduled Eurostar but her hopes of making the last train from Paris to spend Christmas with her sister, who lives north of Limoges, at 1830 GMT appeared slim. "Somebody said the queue was about four hours long. I live on my own so I'd like to get there. Hopefully they will take the situation into account if I miss my train in France," she says. As the queue makes its way along the busy Euston Road, stewards are on hand to offer advice and get people safely across Midland Road as the traffic roars past. One of the happiest people around appears to be a Big Issue seller, who has a captive market of travellers desperate to pass the time. One hour into the queue - and still not in sight of the station entrance - Charlotte Macke looks less pleased. Hugging herself in just a light raincoat, she says she received a less-than-helpful warning of a nine-hour queue from a steward when she arrived at 0830. "They told me to come back tomorrow but I just thought I would rather queue. "Exactly the same thing happened to me last year," says the 24-year-old from east London, who is travelling back to visit her family in Paris after finishing a course in fashion. Impromptu friendships with those around her in the queue are helping to preserve her spirits. "When one person wants to go to the loo, we mind their bags and look after each other," says Olivier Glain, 39, who is travelling back to St Etienne, France, with wife Gaelle, 37. "We just wanted a little pre-Christmas break," says Mrs Glain, "but maybe we'll go somewhere warmer next year." Architectural designer Tina McFarlane jokes that she's looking forward to admiring the results of the £800m facelift which saw St Pancras revamped as the UK's new Eurostar terminal in 2007. "I was going to fly but thought I'd do something more comfortable," says the 65-year-old, who spends her working week in Battersea, south London, but is heading back to her husband in Aix-en-Provence for Christmas. "I came an hour-and-a-half early for my train but didn't anticipate it'd be this bad. My feet are cold but it's OK. At least I've met some nice people." Ahead of the group lies a left turn which will finally bring them on to Pancras Road, where hundreds of people are shuffling slowly towards the station entrance. Halfway along - like a beacon to the cold and fed-up - is a Salvation Army mercy vehicle, where 16-year-old Luke Cozens is handing out free cups of tea and coffee. He answered a Facebook appeal for volunteers to man the caravan, more usually seen at the scenes of major fires. "Staff have been here since 4am," he says, as a colleague puts on a Christmas CD to try to add a little cheer to the atmosphere. "We're getting through lots of water but Starbucks have let us use their taps. Everyone is desperate for a hot drink but people seem happy enough once they get here," he adds. Up ahead, Mark and Lucinda Wegman are almost inside the building after a two-hour wait. Having seen Monday's queues, they decided to enjoy an extra day's Christmas shopping in London and try to get home to Utrecht in The Netherlands on Tuesday. "The weather is OK. It was cold when we joined but it's not raining or snowing," says Mr Wegman. "If you expect the queues, it's OK."
However, they were still facing quite a wait. Once inside the building, the queue snakes through a makeshift concertina of red and white tape before heading around another corner and along a row of plush coffee shops towards check-in. Those queuing may need to preserve their philosophical attitudes for an hour or two yet.